Welcome to our School website. Our Lady of the Cape Primary School, Dunsborough is a Catholic School comprising part of the Catholic Education System of Western Australia located in the Bunbury Diocese. Our Lady of the Cape Primary School was established in 1996. We are a co-educational primary school providing primary education to approximately 340 children from Kindergarten to Year 6. The school is an integral part of Our Lady of the Southern Cross Parish, Dunsborough. We have established a very close working and harmonious relationship between the parish and our school. We have successfully commenced 'double streaming' within the school and now have 2 classes up to Year 4. This double streaming approach will continue into the future each year until we have two classes of Kindergarten to Year 6. We are justly proud of our academic and pastoral achievements and would be honoured to organise a tour of Our Lady of the Cape Primary School, or, if you prefer, discuss the needs of your children and their possible enrolment. Please contact the school, via the website or by telephoning the office on 08 9781 3200. My vision for Our Lady of the Cape Primary School is one where children are educated through a collaborative effort among parents, staff, students, and the community. Our school environment encourages children to take risks and become creative producers without fear of failure. Our Lady of the Cape Primary School will be a place where students are motivated to learn with the help of quality instruction and leading‐edge technology. The student’s spiritual, cognitive, physical, creative, social and emotional attributes will be developed with each student so they may reach their full potential and where achievements are recognised and celebrated. The potential of all students to become self-directed lifelong learners permeates the expectations of the school. Welcome to Our Lady of the Cape Primary School! For most of you, Our Lady of the Cape Primary School is the beginning of your child(ren)’s education. Our staff are thrilled to be building the educational foundation upon which your children grow. Our Lady of the Cape Primary School is a happy, welcoming school in which your children will be nurtured as they embark on their academic careers. We welcome you as partners in your child’s learning and hope you will be a familiar face at Our Lady of the Cape Primary School. Our aim at Our Lady of the Cape Primary School is to maximise opportunities for all students to achieve their full potential in a safe, happy and supportive learning environment. We understand that each student is unique, and we respond to each student’s individual learning needs by developing them from their point of need, particularly in Literacy and Numeracy. We offer a current and relevant curriculum, professionally delivered with modern pedagogies in a high quality, whole school approach to teaching and learning. Literacy and Numeracy are priority curriculum areas and have dedicated teaching times throughout the day. Specialist education is currently offered in Music, Library, Indonesian, Physical Education and Maths Extension. Our Lady of the Cape Primary School also recognises the importance of Information Communication & Technology (ICT) as an integral and key resource to the education of all students in the school. Our Lady of the Cape Primary School successfully runs a 1:1 Laptop programme in Years 4, 5 & 6. Our students and teachers enjoy using our recently built outstanding new facility, a Multi Purpose Hall. 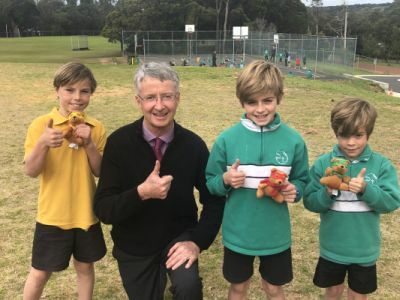 Student engagement and wellbeing is also a priority at Our Lady of the Cape Primary School and we have a broad range of programs and activities in place to further develop and support your child’s social and emotional learning, and values education. Education is so important for each person, both as an individual and as a member of our society. In partnership with parents we will work together to provide your children with the skills, knowledge and values that will support them as they grow up in a complex and changing society. If you would like to find out more about what we can offer you and your child, please contact our friendly staff at the school office to arrange a tour of the school on (08) 9781 3200. I would welcome the opportunity to speak to you about any aspect of your child’s education. Please feel free to contact me at any time.